Skin tags are small flesh-coloured or brown growths that hang off the skin and are usually a few millimeters in size, although can grow as big as 5cm. The medical name for skin tags is acrochordons and they can found on the both the face and neck, and on the body. 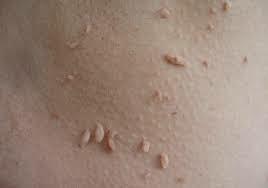 Skin tags are harmless and do not usually cause pain or discomfort. However they can get bigger overtime and be unsightly and affect self-esteem, or may snag on clothing or jewelry and bleed which is why many clients seek to have them removed.